THE MINISTER IN charge of the national drugs strategy has called on communities to take control and report drug dealing at a local level. 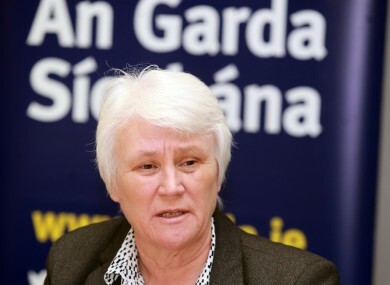 Speaking to reporters earlier today, Catherine Byrne said her own community in Inchicore had been “ravaged” by drugs. She expressed particular concern about young people who are being “sucked in” and asked to distribute drugs at local level or citywide. Byrne also spoke of young people being intimidated by gangs because one of their siblings is an addict or a dealer. Drugs are killing an awful lot of young people in our communities. I can tell you one family in my own has lost four members of their family, out of five children this person has lost four members. There’s too many parents and grandparents rearing children now because family members have passed away of addiction and I think we need to be conscious all the time. Assistant Commissioner John O’Driscoll, who also spoke today as Crimestoppers highlighted its anonymous ‘Dial to Stop Drug Dealing’ line, said gardaí would not have achieve many of the results they have had without the help of communities. So far in 2016, 104 calls have been made to the confidential phone line. As a result of calls last year, crack cocaine, methamphetamine, cannabis, and firearms were seized and a number of people were charged with possession for sale and supple. Sometimes people give information in relation to something which they think is fairly minor, but it could actually lead to a very significant results. By and large, clearly a lot of the information will relate to those who are dealing on the street. But it could be the missing link for us in getting to someone who is further up the chain. “Remember the people who are involved in drug selling, are the people who are involved in the death, that arises from drug use, all the implications in terms of abandoned needles and social problems within the area,” O’Driscoll said. Members of the public concerned about dealing in their area, can contact the Dial to Stop Drug Dealing line confidentially on 1800 25 00 25. Email “'One family lost four out of five children to drug addiction'”. Feedback on “'One family lost four out of five children to drug addiction'”.